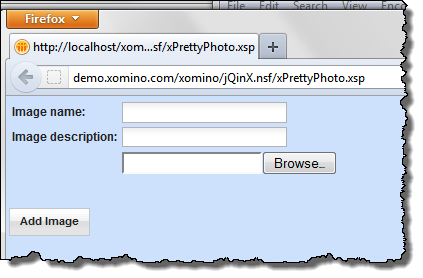 HomejQuery in XPages – prettyPhoto – How does it work? 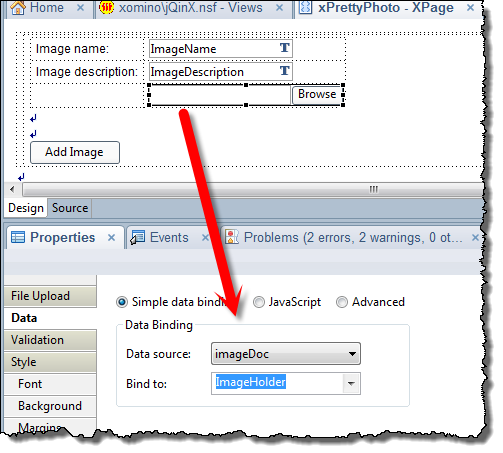 jQuery in XPages – prettyPhoto – How does it work? 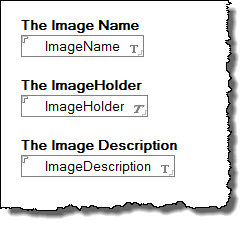 We need to create a view which shows our image name, description and the attachment name so that we can use them for reference. Inside the repeat control we are going to build our Anchor tags and Images. We need to need to get the href, title, alt and src tags from each document in the view. We then move to the XPage source to build our gallery HTML. and we have our gallery. The prettyPhoto library can also handle youtube/other videos by just making the a href link to a video link the prettyPhoto plugin is smart enough to pick it up and run with it. If you look into the prettyPhoto.js file you will see that there are LOTS of configurations which you can play with yourself to change the behavior of the plugin. Because of the following from the website “prettyPhoto is totally free to use, it is licensed under Creative Commons Attribution 2.5. So you can use it in all you projects even commercial ones.” you can make any alterations you like. ← Stunning Firefox plugin – Tilt – 3D DOM visualizer – WOW ! Okay, I am officially in awe of your knowledge now. That is one sweet piece of code. That is very kind of you Roy but I didn’t write the plugin, I just integrated it. Ok this is nice and interesting, but when you open a gallery and go through few images notice the url is changing. So when you try and click ‘back’ on the browser, you aren’t going anywhere until you get to the stage before you clicked on the gallery images. Which is pretty much lame. If you have a solution for this will you please share it!? I am not entirely sure though why you would want to use the back button. What is the use case? If you want to use the back button to cycle back through the images then I would try and find another lightbox. There is a back arrow and a close icon. Why do you need to use the back button? So when you’ve read the document and seen all the pictures you want to go back to the frontpage, than you click back. Which goes through all of the url changes you’ve made by cycling in the gallery. So if you have 5 images in the gallery and open all of them, than you’ll have to click Back 7 times to actually go back. I wrote a very detailed comment but when I click Post I was logged in, and the comment got deleted. Anyways, the use case scenario goes like this on my app. Now he closes the gallery and tries to go back to the front page, when he clicks the back button he cycles through all of the url changes made by cycling through the gallery. The page doesn’t change until he clears the url out of all the url changes made by the gallery. You can try this scenario on your demo app too. The post actually got flagged for approval for some reason – I approved it. I get it now and I can repeat it – thanks for the explanation. Which does not use the URL and does not have the issues you describe – my only suggestion for right now would be to use another plugin if you are looking for a lightbox. Maybe I will take this under advisement and do a subsequent article on a different lightbox. sorry this doesn’t fix your problem but I really appreciate you taking the time to explain and provide the feedback. I notice that when I go to the page and try to add the resources via the gui, it says the path is invalid. Oddly, it says the same thing when I look at the PrettyPhoto custom control in your JQinX.nsf. If I try to edit the Resources, I cannot Edit and save the resources, the OK button stays greyed out. I I try to add an identical resource, I get the same issue, the OK button will not activate. John – my first suggestion is to use Firefox and the HTTPFox plugin to examine all the traffic coming to the page. That will tell you where the XPage “thinks” the images should be and should help point you in the right direction. 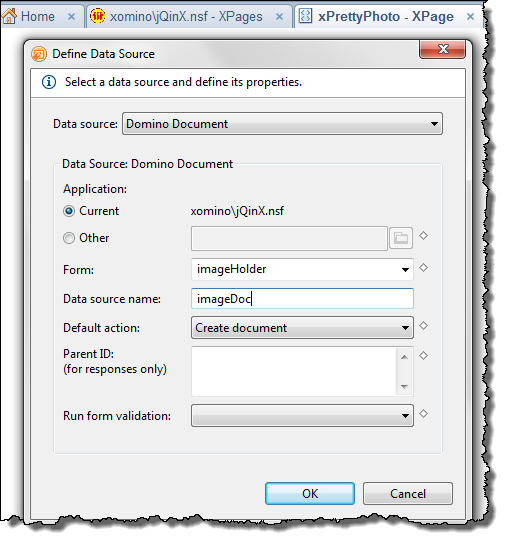 When the resources are added to the WebContent folder they will not appear as selectable in the XPage GUI resource selector – that control is looking in the script libraries and image libraries within the database and your files are not there. That doesn’t stop you referencing it int he source code panel though. The root of the WebContents folder is equivalent to the root of your database in the browser. I use the WebContent folder because it is much easier to manage where all your files are in one place rather than having to go to different areas of the database to get the elements. You can also “see” a folder structure rather than having to rename the files to mimic one. If it is still not working for you let me know. OK, I made a new css file, and copied the contents of prettyPhoto.css into it, and added it to the page. I do not see any files fail to load in the FireBug Net console. FireBug does show a console error on the page that is almost a copy of the demo. So now I have re-copied the WebContent folder, xPrettyPhoto.xsp, formPretttyPhoto, commonContainer to a new db. I still see the exact same issue, same problem in FireBug, same lack of light box. What else am I missing? Forgive me if I understood you wrong, but do you add in the source of the xpage? You need to copy all the files to the Web Content folder, but you also have to actually tell the js and css files to be loaded. Also, the web content is used for this kind of files because it’s a public folder, you might have access issues if you put your files in other folders in the database. Well I think I have, but as I said I cannot do so through the GUI, it will not let me click OK.
Also, I don’t exactly know whay you mean by pressing OK in the GUI, but you should add this resources by clicking the Source tab in designer. 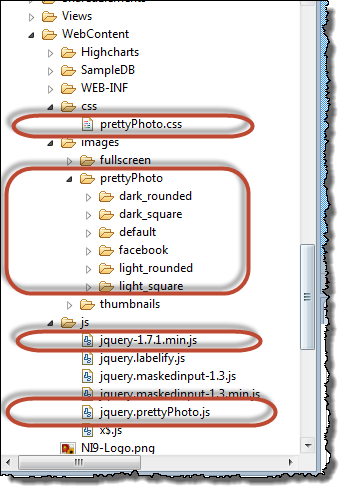 The jquery.prettyPhoto.js is in the Web Content/js folder. Valuable info. Lucky me I discovered your web site unintentionally, and I am stunned why this twist of fate didn’t came about in advance! I bookmarked it. Does the scriptBlock get placed after the or before that? 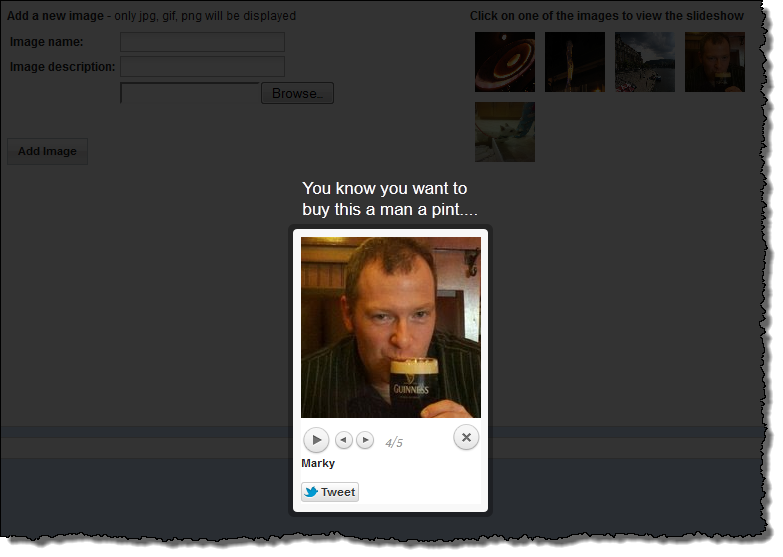 I am trying to prettyPhoto-ify the images I am showing in my viewPanel. if you look in the demo database you will be able to see the order of everything. The script block to prettyPhoto everything comes at the end of the page. Not sure if I am doing something wrong or if this is not really useful when trying to display images in a column of a viewPanel, but I kept getting a HTTP 500 error. I did get it working as I wanted by simply making the column a specific width and matching that width in the image resource tag. its really really good article on building up neww weblog. , j’ai une fois de plus découvert plein de choses intéressante en venant sur ce site. Excellent article. I tried it out. All works fine except for the images in the WEB-INF/images folder. I was able to copy/paste the images but – when browsing to the xpage- the server returns an error for all images. I don’t think anything should be blocked…..using firebug can you see what the error is? You are right. I placed the content below webcontent/WEB-INF. It should have been below webcontent. Q: Can the Prettyphotos being displayed (when they pop up), go back to the beginning? Let me explain. I have 9 photos, when the user browses through all 9, when he gets to the last photo ( ” 9 of 9″) there is no repeating back to 1. (photo 1). My client wants to be able to view all over again after they reach the last photos, instead of using the tiny “back” arrow. Thanks in advance for ANY help. Cindy – do you mean the slide show? 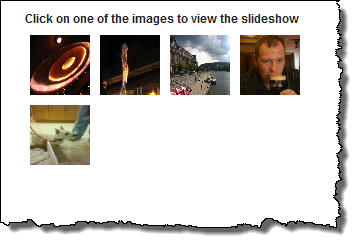 I look at the example here – http://www.no-margin-for-errors.com/projects/prettyphoto-jquery-lightbox-clone#prettyPhoto and when you get to the last image there is an arrow to the right to go back to image one. or do you mean a continuously revolving slide show which does now stop? Yes! That’s correct for the first scenario; being able to view (full size) photo 1 again after the last photo is viewed (in my case photo #9). I hugely appreciate any help or tips. After reviewing the .js file I’m still clueless, afraid that something I try to edit may render the whole thing useless. Gosh, I’m so sorry I just realized I’m inquiring support in an xpages forum. I deeply apologize in the event someone boots me out. I’m confident all of you here play Crew Fortress 2, or else you wouldn’t be below! get my head about was accumulating all the items!! I’v discovered some players cant even collect most of the items, by no means mind ALL of them!! I was dedicated to getting all the objects, but it seemed impossible, so getting an knowledgeable programmer, I got to function! any of the items you would like in TF2! it! Just read the tutorial below detailing how to get and use the tool! 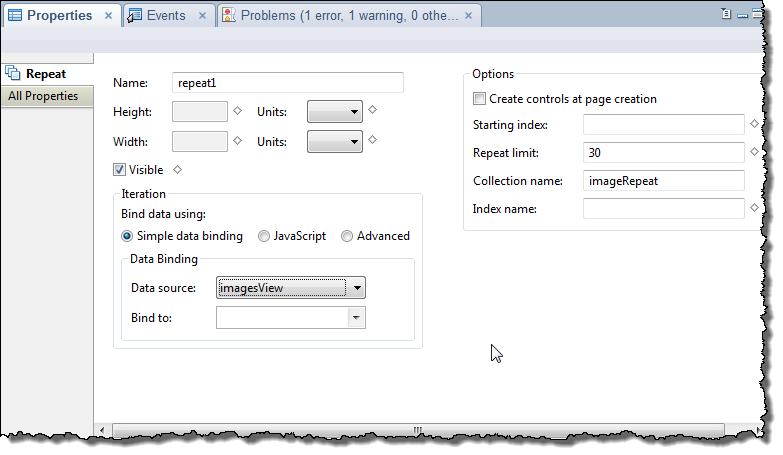 Thanks for finally writing about >jQuery in XPages – prettyPhoto – How does it work?